I write tutorials on Android development and develop a few apps myself. See the writing section for my tutorials or read on below for details of my apps. The Nonsense, Complete Nonsense and Extreme Nonsense apps are available now. Nonsense is utterly pointless but funny depending on your perspective. See some examples of Nonsense in the Ultimate Hall of Fame. Generate and create pieces of Nonsense. A bit like MadLibs but shorter, faster and funnier. Nonsense has random, automated functions to make the process less hassle and more unpredictable. Nonsense has three categories, each with 10-15 templates and its own vocabulary store, making for thousands of possible combinations. Complete and Extreme Nonsense have ten categories, each with 10-15 templates and vocabulary store, making for thousands of possible combinations. As well as extended categories and vocab, in Complete and Extreme Nonsense you can hear your Nonsense spoken and save your favourite pieces of Nonsense to the Hall of Fame. Extreme Nonsense is the adults only version. As much or as little user input as you like, you don't even have to enter any words if you don't want to, just let Nonsense choose randomly. There's grammatical info in there if you want it. Pointless? Yes. Compulsive? Also yes. Nonsense generates random pieces of English in different categories. You can either create your own piece of Nonsense or simply press the button to generate one at random. 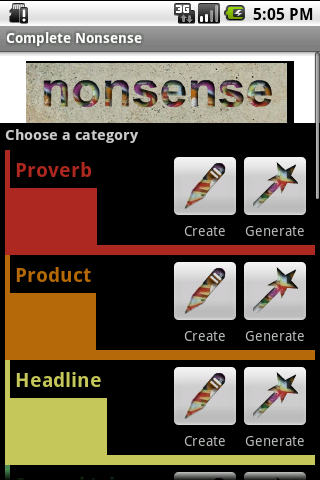 Generate Nonsense proverbs, headlines, book and artwork titles, products, jokes, tv shows and more. Nonsense is a little like a very casual version of Mad Libs with short sentences and phrases rather than whole stories, and with a larger proportion of the resulting phrases being generated, meaning there are far more alternatives than with the traditional Mad Libs format. Nonsense also has more automation and assistance built in than a typical MadLibs app, and has some grammatical information included too. Each Nonsense category has a number of templates stored for it. Each template has a number of positions for different terms in particular Parts of Speech. 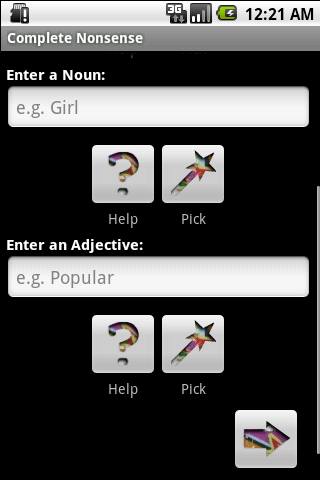 Terms are slotted into the positions, either by capturing what you've entered, or after being selected at random from the Nonsense vocabulary store. The basic idea for the automatically generated pieces of Nonsense is that an excerpt of language can be grammatical but still not make a lot of sense. It's really just a bit of fun for language geeks. The basic (free) Nonsense app has three categories in it - Complete Nonsense currently has ten. 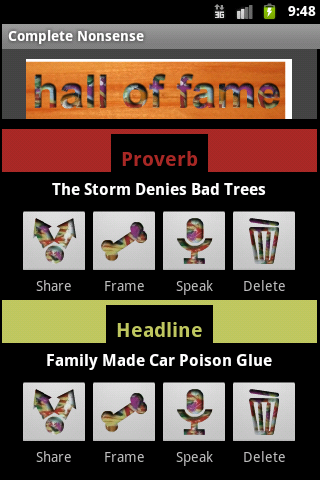 Complete Nonsense also has more templates/ vocabulary, and additional features including the ability to hear your Nonsense spoken, and to save your favourite pieces of Nonsense to the Hall of Fame. An adults-only rude version, Extreme Nonsense is also now available, containing lots of swearing, obscenity and general filth. 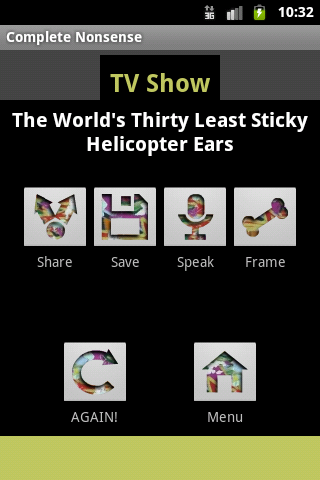 Nonsense, Complete Nonsense and Extreme Nonsense are available from the Google Play and a number of other appstores, including Opera Mobile/ Handster. A lot of the people who have downloaded Nonsense seem to really hate it! It's ok though - that means IT MUST BE COOL. 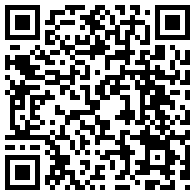 Email me (Sue Smith) at android@benormal.info for anything to do with Nonsense.